This card was created as a thank you for my daughter's basketball coach. Topper - white watercolour paper stamped with free stamp from Cardmaking and Papercraft, (Issue 100, January 2012), then heat embossed with white embossing powder. Image sponged with Distress Inks, then parts of the image highlighted with Distress Inks painted on with aqua brush. 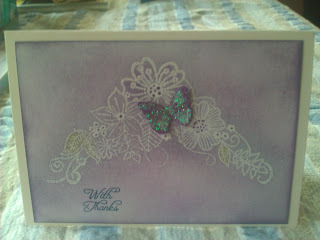 Butterfly punch from Martha Stewart, punched from purple paper, then covered with Stickles. 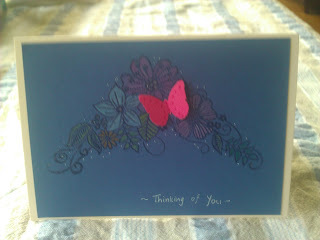 This card was created for a friend who is ill. This time I stamped onto dark blue watercolour paper, and heat embossed with clear powder. I then coloured parts of the image with coloured pencils, dotted around the outside with Atyou Clear Spica pen. Sentiment handwritten with white gel pen.